Amy's Colour Wheel Post got me thinking when I saw this in my vintage needlework magazine. This would be a great springboard idea, I think! Oh great...another project to add to my list! LOL!! My boys LOVE StarWars right now. So, lucky me, I was given a little boy's Darth Vader costume for my little guy, and my big guy wants to be Luke Skywalker. I was excited to sew garments again. Fabric shopping was another ADD experience for me. OOOh wouldn't that paprika colour be a great winter coat for me? OOOh, that would be great fabric for a simple dress for the Christmas gala this year. A little nattering voice inside me, however, kept reminding me of last Halloween. Same pattern of excitement. Stoked to start. Couldn't wait to finish. Garment sewing is not my favourite. But alas, Luke is complete. After a bit of an 'itchy' problem with the wool fabric, I whipped up an undershirt to go under his tunic, and we're all set. I felt like I was on Project Runway sometimes, the way I altered and created! More photos tomorrow of the whole costume, as 'Luke' is at school right now. But I did manage to snap a pic of the boots I made for him. Done in faux suede, fitted over a pair of his rain boots. I sewed strips together in rows to get that layered effect like the original Luke boots. So off I go to Ikea with my husband and kids. Kind of a date you know...drop the kids off at the playroom (free babysitter for an hour!) grab a coffee and browse the store! Bliss! The only problem is... that cutting room table with all of the lovely drawers? $800 here. And seriously. Do I want a pretty cutting table, or put the money towards a better machine? I could look at that room all day. I know exactly why my quilting hasn't been productive in the last while. The fairies haven't appeared to help me out. In order for me to get any inspiration to craft, I need to fix this. Pronto. I think Ikea is on the list for tomorrow...need storage. Do you ever wonder if you'll ever ever ever win? I was beginning to. And then I did! Beth was hosting a giveaway of two patterns and a sweet treat of 1.5" strips...and I won.I love the oranges and greens in these fabrics!! 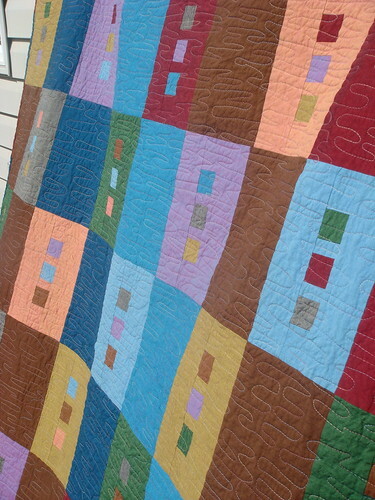 The art quilt design is so pretty...Hooray! Thanks again, Beth! I've actually won another giveaway (!! ), but haven't heard from the poster yet, and don't want to seem too anxious about it. She just got back from quilt market and I'm thinking it's a whirlwind time for her right now. I'll post about it when I hear more. In other news...I got back from Vancouver from a FABULOUS Thanksgiving weekend trip. But of course, came down with some kind of flu/cold whatever it may be. It's almost gone now, but now I'm in catch up mode. I went thrifting today and found a really special deal. Here's a sneak peak.... can you see the date on this gem? We have travelled for 12 hours by car to be with family in Vancouver for Canadian Thanksgiving Day/weekend. It's been amazing and so soothing for our souls and for our heartstrings. On the bad side...it's in the middle of Quilt Festival, and I have limited access to email/computer time, so I cannot respond individually right now to your comments. I will do so by the end of the week. Please know how much I value and treasure your comments and your visits. They motivate me, and make me feel so wonderful knowing there are so many wonderful other quilters out there. We're an amazing community and I'm so thankful to have found this 'outlet'. I will be by to check out your blogs and comment later on the week...thanks for stopping by! 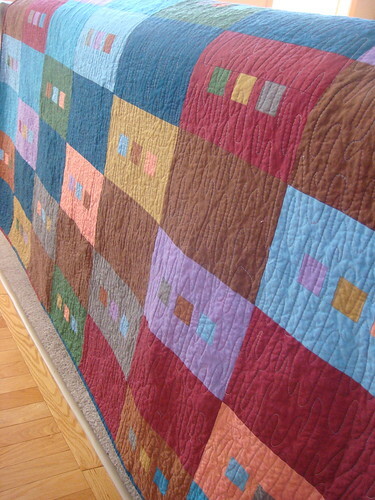 I have had a fairly unproductive few months since our April Festival...but I did get about 4 quilts finished! ***Edited to change - it's not in the April 2009 issue, but the February 2009 issue! Sorry if you've been looking, my error! 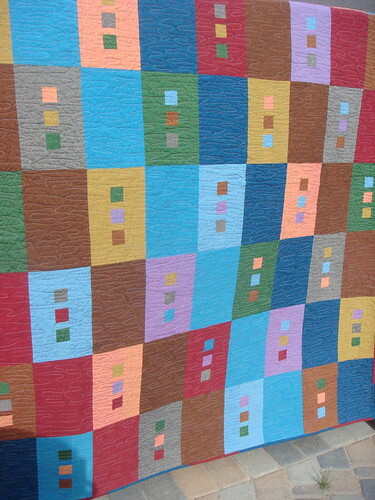 Fall Bloggers Quilt Festival 2009 coming soon! Come and join in on the fun! Go www.parkcitygirl.blogspot.com for more details! Prizes, new friends, new blogs, lots of gorgeous inspiration....come on... you know you wanna! I went through every piece and kept all of the solids and some print pieces that I liked...and some of the warm and natural, couple meters of unbleached muslin, and big knitting needles (not sure why they were there!) So, I've added quite a bit of pieces to my stash. It never occurred to me until Mel mentioned to cut it, group it and sell it on etsy. I really like that idea....except I read it AFTER I had made arrangements for my buyer to pick up the boxes. So. It's been a good day. Extra stash for me. And no money lost. Just a bit of time. But fun. Still coveting my Juki and a quilting frame. The bad part? My husband would buy it in an instant for me. I just can't justify it yet. I found someone's stash this weekend....all for$40. Now, after rummaging through the boxes, I'm wondering if I paid too much for it, as there is alot of stuff in there I probably won't use. But, I'll go through it and donate the rest, I guess. Lesson learned. But when you read an ad that says 10 boxes of quilting cottons for $5 each, I kind of got excited. And when you arrive at the house, you get excited, and nervous, and I'm not the kind of person that says, um no...this just won't work for me. I'm dreaming about a juki machine and a frame....went to the creative stitches show (like a sewing trade show) this weekend and found my thing.